I received a phone call at work recently from a man who was looking to get a second opinion, make that his fourth opinion, on how to treat and cure his advanced macular degeneration. He told me that he had wet macular degeneration and had lost much of his central vision. As a registered nurse, we encourage second opinions, whether it is from our healthcare facility or another reputable one. I applauded the patient for not being passive about his vision and for continuing to search for answers to help improve his eyes. He was seeking to see one of our retina specialists to find out if there was any other treatments available to reverse his wet AMD that hadn't been offered by his other retina specialists. When I asked him if he had ever considered seeing a low vision specialist to see if there were any eye glasses and vision aids that could help maximize the vision he did have, he told me he never knew about such a service. Maybe this is true for you or one of your loved ones. Perhaps you are struggling with the loss of central vision, making it difficult to read, perform a hobby, or write checks. There are so many helpful and life changing eye glasses and technologies that can maximize the vision a person does have. 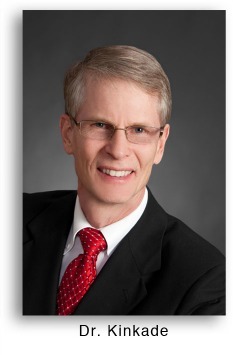 Dr. Randy Kinkade, OD, MPH, FAAO has practiced in the field of low vision rehabilitation for 30 years. He often lectures on the newest options for enhancing sight. He tells his patients, "I cannot make your vision the way it was, but I can often make it better".